Hard Spun (SRO) often played the role of runner-up during his career as a racehorse, but he leads the way in the breeding shed. Hard Spun leads all first-year sires by 2009 CI, at 3.70, and comes in second by CPI, at 4.89 Only Street Sense (SRO) bested him in CPI (5.07), but the Derby winner fell considerably short on CI with a 2.76 rating. And with 181 mares bred in his first season, Hard Spun leads that category as well -- his nearest competition was Gainesway's Corinthian (SRO), with 175 mares bred. Given the warm reception, I wouldn't have been surprised to see Hard Spun's 2009 fee remain steady, despite Darley's general price cutting. Not so -- the son of Danzig dropped 20%, from $50,000 to $40,000. Hard Spun is one of the last chances for Danzig to directly cement his sire line in the U.S. I like Hard Spun as much for his broodmare sire, though. Turkoman scored as a damsire with Point Given (SRO) and I believe this Alydar son's influence helped to create the gameness that Hard Spun showed off to the world. Turkoman's genes will help Hard Spun pass on more stamina than some other Danzig-line sires. 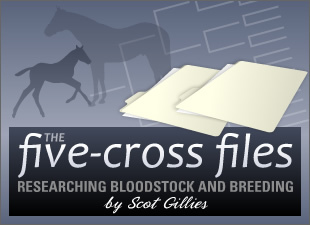 I noticed a few similarities between Hard Spun's five-cross pedigree and that of Big Brown, interestingly. Both are from the Danzig line -- an obvious first comparison. But Both have a second dam from the Roberto line... both have crosses of Round Table and My Babu... both were multi-millionaires with 7 wins, and were unbeaten as juveniles.